Doug and Rodney made their debut in Salem as part of a family band. They played for square dances and pie suppers mostly. Their dad played fiddle, their mother guitar and the oldest brother keyboard. They played all the old-time numbers like "Sally Goodin'" and "Bill Cheatham". As a teenager Doug Dillard (born March 6, 1937) and his lifelong buddy Bill Glenn played up and down the streets of Salem/Missouri and played songs for anyone who would listen. Doug started to play guitar at the age of 5 and got his first banjo at the age of 15. 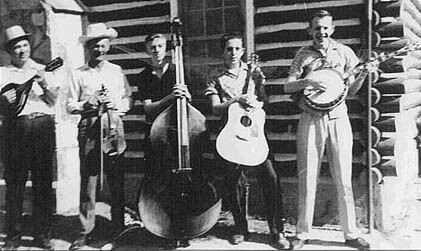 In 1953 Doug played banjo for the "HOWE TEAGUE BAND" and later brother Rodney too. From 1956 to 1959 Doug and younger brother Rodney Dillard (born May 18, 1942) along with Bill Glenn and friends Henry Lewis, Jim Lewis and Paul Breidenbach formed the "OZARK MOUNTAIN BOYS". Mitch Jayne, a local radio personality, invited the boys to play on "Hickory Hollow" his weekly Saturday morning radio show on KSMO in Salem. 1957 Doug played also with the "HAWTHORN BROTHERS" and during that year and 1958 he appeared on TV with the "Lee Mace and the Ozark Opry". Special guest Dean Webb (his mandolin and vocals were later added!!!). 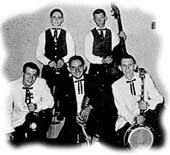 In 1958 and 1959 Doug and Rodney got together with the "Hawthorn Brothers" and the "Lewis Brothers" in a bluegrass package. Note: "Banjo in the hollow" was written by Doug Dillard - on the single is written "Ron & Dug" Dillard. The Dixie Ramblers played in clubs around the St. Louis area, but the Dillard brothers soon left the band. Note: K-Ark released under their Discoteque series - probably from the early 70's - 6 song 7" EPs used to stock jukeboxes. They did a series of them with The Dillards, Onie and Karen Wheeler, Eddie Bond, Carl Phillips, etc... .
After a few years - Doug was a book-keeper in St. Louis and Rodney was in college (only a few weeks before final exams) - Doug and Rodney agreed to try their luck in being a full time musician. Doug and Rodney hooked up with Mitch Jayne (born July 4, 1928) and plotted their future. Mitch Jayne taught backwoods schools and was radio announcer in Salem. Findind a mandolin player was simple. The Dillards called Dean Webb (born March 28, 1937) and laid out their plan. They met Dean at "The Ozark Opry" in 1960. Dean started playing in a band with two cousins, Duane and Clifford Webb. The group played for hospitals and retirement homes in Independence and Kansas City on a volunteer basis. He also took a job as a bass player in a local band which played dance music in the various honky tonks. He eventually hooked up with a young banjo picker, Lonnie Hoppers and Bob Penny to form a bluegrass band, the Ozark Mountain Boys. (This was a different band than Doug Dillard's band with the same name!) Mitch joined the Dillards because it provided him the perfect opportunity to shine in public doing what he did best, spinning yarns and telling tales about the people of the Ozarks. The only instrument the Dillards needed was the bass and so Doug, Rodney and Dean taught Mitch how to play the bass.